In the late 1990s, as computers were becoming vastly more powerful, Stuart Rogers began working on Pegasus 5 -- software that made use of this increasing processing power to dramatically transform how airplanes and spacecraft are designed and built. "It can be applied to many, many different types of problems, from airplanes to spacecraft to rockets to internal flows," says Rogers, who has worked at NASA's Ames Research Center since arriving in 1984 as a student. "If you've already studied your whole design space in the computer, then you only need to build a wind tunnel model to verify that performance." 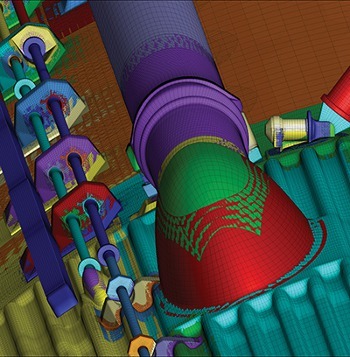 The software itself is a preprocessor for overset-grid computational fluid dynamics (CFD) simulations. This CFD approach divides large domains into smaller, more workable segments. Pegasus 5 reassembles the pieces, stitching together the various parts of this complex geometry for what's called a flow solver. The flow solver then computes the aerodynamics or fluid dynamics for the problem at hand. Before Pegasus 5, piecing these segments together was a painstaking process consuming much more time and user input, creating opportunities for errors. "We set about trying to improve the capabilities that we had and really sped up the process dramatically," says Rogers, who took over the project from Norman Suhs and William Dietz, both of whom were working for Micro Craft in Tullahoma, TN, at the time. Suhs and Dietz had developed earlier versions of the software, which began as a NASA/Air Force partnership. The two then completed the initial Pegasus 5 implementation before handing it back to the Space Agency's in-house team, where Rogers continued to update and maintain it. Suhs and Dietz kept in regular touch with Rogers after that. "Pegasus 5's primary goal was to come up with new algorithms to really automate the process of gluing together all these geometrical parts without so much user input, so you didn't need a super-experienced user to do it," Rogers says, crediting Suhs as the primary developer of the new algorithms, a number of which were published in 2002 for public-domain use by any developer. Rogers' work on Pegasus 5 began in 1998 at NASA's Advanced Subsonic Technology (AST) Program, a joint research effort with Boeing. The multiyear program supported the development of Pegasus 5 for two years, a process that involved Boeing from the beginning, as the company helped define the technical requirements of the final product. Boeing was one of the first companies to apply Pegasus 5 "to very complex and realistic aircraft configurations," according to Robb Gregg, chief aerodynamicist for the company's Commercial Airplanes Division, located in Seattle, WA. The company lobbied "for a greatly streamlined and automated alternative to PEG4," Gregg says, referring to Pegasus 4, the upgrade's predecessor, which Boeing also used. "The AST Program recognized the need to improve the overset grid connectivity process and funded the code development," he says. 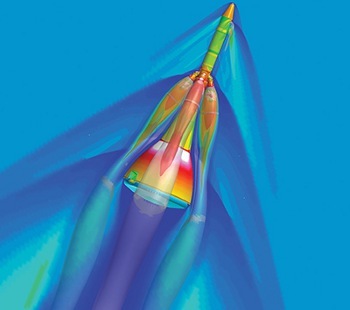 The aircraft manufacturer also used NASA's flow solver, OVERFLOW CFD, for aerodynamic and fluid dynamic problems. As soon as it was established that PEG5, as Gregg calls the upgrade, could preprocess grid data for OVERFLOW, "PEG5 rapidly became the primary overset connectivity tool within Boeing," he says. As he used Pegasus 5 over the years on increasingly powerful computers, Rogers saw how to make it better. "We made incremental improvements to the software, none of which were actually funded directly by any program," Rogers says. "The more you use it, the more you find, 'Hey, it'd be great to do this or add a couple features to that.' That's how it's been developed since then. When I have spare time I try to put in new features and improve the code a little bit." Every once in a while, Rogers releases a new version and sends it to NASA users, Boeing, and other companies. The code has been distributed to more than 470 organizations in industry, academia, and the U.S. Department of Defense. The latest version of Pegasus 5 is available in NASA's online software catalog, which automates the process of obtaining software by generating the required nondisclosure agreements. Unlike the early days, Rogers is no longer in personal contact with everyone using his software. Pegasus 5 has been used to develop or upgrade essentially every major NASA spacecraft in the last 15 years. In addition to his Space Shuttle work, Rogers has used Pegasus 5 to run simulations for NASA's next crewed spacecraft, Orion, as well as the Space Launch System, which is being built by Boeing and will transport astronauts aboard Orion into orbit and beyond. Boeing, meanwhile, has been using the software widely to develop and support its commercial airplanes, military aircraft, and spacecraft. The company used Pegasus 5 in the development of its wide-bodied 747-8 -- the longest passenger aircraft in the world -- and the latest versions of the 787 Dreamliner. This rendering of the surface of the Space Shuttle's external tank illustrates the complex geometry capabilities of the Pegasus 5 software. Boeing's Gregg notes that while Pegasus 5 helps the company save time, an even more important benefit is the reduction in potential user errors. "Previously, we had to either simplify geometry or strictly limit the use of overset-grid CFD to the verification of the design, which was typically developed using other in-house capabilities," Gregg says. "Today, much of the uncertainty of analysis and design has been eliminated," and much of that is thanks to Pegasus 5. In May 2016, when Gregg wrote a letter on behalf of Boeing encouraging NASA to consider Pegasus 5 for the Agency's Software of the Year Award, he wrote that "without PEG5, we would not be able to efficiently design and analyze the wide array of aerospace products that we build at the Boeing Company." "While we always knew this whole approach was pretty powerful," Rogers says, "sometimes I'm still amazed at what we're able to do now compared to what we could do 20 years ago." This article first appeared in the 2018 issue of NASA Spinoff. Read that full issue here.